Mario Carpo. The Alphabet and the Algorithm. MIT Press, 2011. 169pp. 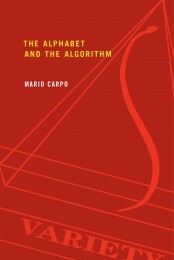 Mario Carpo’s The Alphabet and the Algorithm presents a concise and compelling account of the rise and fall of what he calls the “modern paradigm” of architectural practice from its emergence in the authorial obsession of Alberti to its obsolescence following the “digital turn” of the 1990s. Though this story has been told before, Carpo imparts to it a rare sense of calm inevitability. His book leaves the reader with an enigma: why is architecture still saddled with an authorial ambition apparently so at odds with the current technological and social situation? The style of Carpo’s book should be a model for “popular” works of architecture history and theory. Carpo combines nuanced scholarship of the rise of modern architectural notational systems and the author function in the early Renaissance with a sensitive account of their eclipse by a new paradigm in the last fifty years. All of this is so well argued that when speculative bits pop up they are not nearly as jarring as they would be in an unadulterated manifesto. But, while this is indeed a rhetorical virtue on a casual read, the overextensions of Carpo’s description of the present, once noticed, have a way of casting suspicion over everything else. This is unfortunate; a critical reader of Carpo’s book would be wise to separate the historical from the projective to give each its due. Roughly one third of the book distills the conclusions of Carpo’s ongoing scholarship into the interplay of mediums and modes of practice of architecture in the Renaissance, a topic which he has presented before in Architecture in the Age of Printing (MIT Press, 2001). Carpo succinctly argues that a desire for the ability to reproduce things identically arose at the same time as, or perhaps just prior to, the technological inventions, such as printing, that would satisfy it. That is, means of creating identical copies were not only proliferating where they made economic sense – where, for example, they overcame the limitations of medieval manuscript copying or introduced new efficiencies in manufacturing – but, more profoundly, they were being sought out where their application would not seem necessary. This happened especially in architecture: architects began to produce drawings which would be “copied” in the form of buildings, even when the drawings themselves were manually created and modern technologies of production played no special role in construction. Carpo argues that it was the desire for to forge links of identicality between mind and drawing and between drawing and building that necessitated new notational systems and brought about modern architectural authorship, not the other way around. In this new regime, the architectural project was the drawings themselves, which contained the idea of the building. The building was only a (usually imperfect) copy. Regarding the turning point between pre-modern and modern architectural authorship, Carpo compares Alberti – the “author” of the modern regime – with his contemporary, Brunelleschi, who is often acknowledged as the first architect-as-author. Carpo dramatizes how Brunelleschi was still operating within the medieval tradition of craftsmanship; his authorial role entailed complete control of the construction of the building through daily contact with workers and tyranny over the job site. Alberti brought this desire for control into the modern era by making it fully mediated. Rather than being present during construction, he would send a set of drawings that completely described the building. The workers would simply copy these at a larger scale. Carpo describes the inventions in geometry and notation that made this possible and the limitations that would lead to its undoing, namely the “notational bottleneck” whereby only buildings that could be described in precisely-measureable drawings could be built. Complex geometries, in particular, were ruled out. Leaping centuries ahead to the recent past, the second third of Carpo’s book chronicles the idiosyncratic evolution of an architectural subculture that sought to create exactly the types of geometries excluded by the Albertian regime. For Carpo, the impetus came not from the new possibilities of technology, but from architects’ loose reading of philosophy – in particular The Fold: Leibniz and the Baroque by Gilles Deleuze, translated into English in 1993. This fueled a desire for new forms and notational systems which only the computer could satisfy. Carpo identifies two new modes of practice, both of which run counter to the Albertian tradition of authorship. On the one hand, as digital models overtake drawings as the privileged medium of design, the daily work of architects begins to look more like a craft – building in virtual space – than an abstractly mediated pursuit. But perhaps more consequentially, the computer also allows a shift in the object of design: architects no longer need to design individual buildings. Instead they can author “generic systems” (aka algorithms or objectile) that can be used to create whole families of architectural forms. And this, for Carpo, is the death knell for Albertian authorship. Today, Carpo argues, the “primary author” sets up a generic system while “secondary authors” or “interactors” merely specify the specific manifestations we call buildings. Carpo’s support for this argument draws upon examples at the margin of architecture – a famous tea service by Greg Lynn and a set of tables by Bernard Cache – which are made to carry the possibility of effortless variability in all realms of design and production, including buildings. It is in describing what he sees as the new status quo of infinite variability that Carpo ventures almost imperceptibly into the genre of the manifesto. Claims such as “there is no reason why… mass-customized [objects] should be more expensive than… mass-produced” ones (103-4), taken at face value, are manifestly false. Look around you for a second. Most of what you are likely to see are the products of modern mass manufacturing. Windows, exterior cladding materials, furniture and fixtures: all of this is as subject to economies of scale as it was fifty years ago. To pretend, as Carpo does, that there are processes to create these products at the same cost but with infinite variety in shapes and sizes is disingenuous. But a generous reader will take Carpo’s assertions not as statements of fact but as a challenge. Architecture’s new horizon, according to Carpo, is effortless variability in production and authorship of generic systems. We ought to move towards this inevitability rather than postponing its arrival. Carpo inhabits these new possibilities as if they were a reality; this may be his book’s greatest strength. Carpo lines up his historical argument so nicely that one wants to believe that architects see the world the way he does. But, despite the sense of a looming apocalyptic paradigm shift that has suffused the culture of architecture for several decades now, the model of practice Carpo champions is appearing only gradually, and at the margins. Rethinking architectural agency – that is, identifying the domains in which architects have leverage and the methods by which their efforts are best applied – is long overdue. But, as Carpo himself points out, nostalgia is a powerful force. He notes that Rem Koolhaas’s S,M,L,XL – a tome that is de rigour for contemporary students of architecture – is “conspicuously contrary” to current trends in its “unapologetic celebrat[ion]… of the standards of an age gone by.” (106) This cuts to the heart of architecture’s current dilemma. There are enough high-profile holdovers from the old, modern model of authorship for rising generations to emulate that it would be foolish to expect anything but the Albertian regime to dominate for the foreseeable future. Carpo, Mario. Architecture in the Age of Printing. Cambridge: MIT Press, 2001. Print. Deleuze, Gilles. The Fold: Leibniz and the Baroque. Minneapolis: University of Minnesota Press, 1993. Print. Koolhaas, Rem and Bruce Mau. S,M,L,XL. New York: Monacelli Press, 1995. Print. Matthew Allen is an Assistant Professor at the University of Toronto. He has a Master of Architecture from the Harvard Graduate School of Design and degrees in Physics and the Comparative History of Ideas. His writing has been published in Log, Domus, PROJECT, and elsewhere.